Miltefosine, the only oral drug approved for the treatment of leishmaniasis—a parasitic disease transmitted by sandflies—is considered as a success story of research and development (R&D) by a public-private partnership (PPP). It epitomises the multiple market failures faced by a neglected disease drug: patients with low ability to pay, neglect by authorities and uncertain market size. Originally developed as an anticancer agent in the 1990s, the drug was registered in India in 2002 to treat the fatal visceral leishmaniasis. At the time, miltefosine was considered a breakthrough in the treatment, making it feasible to eliminate a regional disease. Today, access to miltefosine remains far from secure. The initial PPP agreement which includes access to the public sector is not enforced. The reality on the ground has been challenging: shortages due to inefficient supply chains, and use of a substandard product which led to a high number of treatment failures and deaths. Miltefosine received orphan drug status in the USA; when it was registered there in 2014, a priority review voucher (PRV) was awarded. The PRV, meant to facilitate drug development for neglected disease, was subsequently sold to another company for US$125 million without, to date, any apparent impact on drug access. At the heart of these concerns are questions on how to protect societal benefit of a drug developed with public investment, while clinicians worldwide struggle with its lack of affordability, limited availability and sustainability of access. This article analyses the reasons behind the postregistration access failure of miltefosine and provides the lessons learnt. Miltefosine is a major therapeutic advance as the only oral drug for leishmaniasis. Its development showed that public-private partnership (PPP) is a viable model for promoting research and development (R&D) in neglected tropical diseases (NTDs). However, access to miltefosine postlicensure is limited. Low availability and affordability have been key issues globally, despite an agreement between the manufacturer and public institution(s). Mechanism(s) to enforce framework and legal agreements between partners need to improve. Ensuring access downstream is imperative: any new NTD tools being developed should include a postmarketing or postregistration access plan. Drug pricing structures should be transparent: manufacturers should not take advantage of a monopolistic situation to overcharge. Priority review voucher as an incentive to enhance R&D for NTD needs fixing; applicants should seek regulatory approval and demonstrate appropriate access strategies. To this day the drug remains valuable as a partner drug in combination regimens to treat VL and for several other clinical indications, yet miltefosine is hardly available in countries where leishmaniasis burden is high. Widespread adoption of miltefosine was challenging, due to various reasons that this paper attempts to unravel. Fifteen years ago, WHO/TDR made a substantial R&D investment with a clear goal to reach people in need of life-saving medicine, yet access to this medicine remains compromised. We analyse the lessons learnt in the context of R&D for NTDs, the postlicensure phase and recommend strategies moving forward to increase access to this drug. Milestones in miltefosine’s journey. R&D, research and development; VL, visceral leishmaniasis. However, implementation of miltefosine treatment faces certain challenges. Miltefosine’s reproductive toxicity requires women of childbearing age to avoid pregnancy during, and for at least 3 months after treatment.57 The required pretreatment pregnancy screening and contraceptive cover severely hindered roll-out through primary care services in resource-limited settings. Gastrointestinal problems are common adverse events: up to 62% patients report vomiting/diarrhoea, although self-limiting.31 40 47 When the drug is self-administered, even mild adverse events may compromise adherence to a full regimen. Transient elevation of hepatic transaminases and mild renal dysfunction affect up to 10%–15% of patients.50 In phase IV trials in India and Bangladesh enrolling ~1000 patients, each recorded one death possibly related to the gastrointestinal side effects of miltefosine.50 51 Adverse events are thus common and need to be managed accordingly. Miltefosine was initially registered in India and Germany. Later, it has been approved for treatment of VL in Nepal, and for both VL and CL in Argentina, Bangladesh, Bolivia, Colombia, Ecuador, Guatemala, Honduras, Mexico, Pakistan, Paraguay, Peru, Israel and the USA—though some licenses may have lapsed and not been renewed by the company. Miltefosine received an orphan drug designation in the European Union in 200273 and the USA in 2006.74 WHO included the drug in its EML in 2011,25 26 underlining its public health importance. Affordability is a critical issue for medicines developed to treat a poverty-related disease. An economic analysis has shown that for miltefosine to be an effective public health tool, the drug should cost no more than US$50–60 per treatment.45 75 The initial agreements, in the form of a memorandum of understanding between WHO and Asta Medica in 1995 provided the framework to ensure availability and affordability of the drug (see figure 1). The company was allowed to market the drug in the private sector but had to make it available at a preferential price within the public sector in all developing countries, conditional on the free provision of the drug to patients. The agreements stated that this preferential price should allow the company to recover the production cost plus a modest mark-up, while setting the price for the private sector would remain under the company’s control. But, as the negotiation for the preferential price took years, miltefosine was at first only available in the private pharmacies in India at a cost of US$150–200 per treatment.27 This price is three to four times higher than the preferential one and well beyond the means of the majority of patients with VL, who had to pay out of pocket. The situation improved when preferential pricing was put in place, and after miltefosine was restricted to the public sector in India. Based on the initial agreement, the price of an adult treatment varied between €45–54 (US$54–64) depending on order quantity, at the time set at minimum 75 000 capsules.76 In the 2004 application for inclusion in WHO EML, the price quoted by Zentaris (Asta Medica spin-off acquired by Aeterna in 2002, later became Aeterna Zentaris in 2004—see figure 1 for complete chronology of ownership changes) was €80–300 for full adult treatment, the former for use in developing countries and the latter for the private sector.77 However, the preferential price has gradually increased over time, and for a period, it was only applicable when buying a full batch or 200 000 capsules (equivalent to 3500 treatment courses), a challenge for control programmes in countries like Nepal or Bangladesh with lower case numbers. Paladin (the owner company in 2008–2014, see figure 1) expressed in its 2010 application to WHO EML that price would not be a barrier,25 yet the conditions that need to be met for the preferential price were often unclear. The pricing structure provided by the supplier was not transparent: between 2009 and 2014, the price obtained by a non- governmental organisation (NGO) operating in endemic countries reached €250. Currently, the preferential price, according to Knight Therapeutics, sits between US$120 and US$160 per course, although there is no longer an obligation for minimum quantity (see table 1). Table 2 gives an overview of the main availability issues by region. The situation is indeed diverse. In the Indian subcontinent, frequent shortages of miltefosine have been reported by healthcare providers.28 Small-scale donations made possible by Paladin (see figure 1) did not solve the underlying problems. Obstacles to securing supply include bureaucratic, rigid tender mechanisms for public procurement; inadequate delivery systems; lack of buffer stock and difficulties in forecasting demand, as well as the long production lead time at the manufacturer. The minimum order quantities that were imposed by the company to be eligible for preferential prices for public or not-for-profit sectors seem to play a role, nonetheless. Earlier requirements to purchase a minimum of a full batch were not always compatible with the needs of the procurers (eg, for second-line treatment or clinical trials). The requirement thus had led to oversupply and wastage as the shelf life is limited, while substantial amounts of miltefosine expired in the manufacturer’s warehouse and had to be destroyed. Moreover, the global availability of miltefosine has been mostly depending on a single source. The ownership rights have been retained by the private company and have been exchanged over the years through business mergers and acquisitions (see figure 1). The change of companies for miltefosine has led to delays in delivering the drug on time. Since 2016, Knight owns worldwide rights to Impavido (miltefosine) related to its sale and distribution in all countries other than the USA.83 84 There, it was initially available through the Centres for Disease Control and Prevention and since 2015 after being approved for leishmaniasis by FDA, through Knight’s licensee, Profounda (figure 1). Currently, to say that the drug is freely available in the global market is an overstatement. Entities that need miltefosine have to approach Knight directly and negotiate, with little scope of collective action. Even in the Indian subcontinent where miltefosine is no longer first-line treatment, the medicine is still sorely needed for an alternative regimen, used in combination with paromomycin or liposomal amphotericin B (AmBisome)—and for treatment of HIV/VL. There are no accurate data on how many patients were treated with miltefosine since it was registered for VL. However, from 2008 to 2014, 163 000 VL cases were reported in India alone.85 The majority of these patients were supposedly treated with miltefosine. Miltefosine represents a major therapeutic advance for the treatment of leishmaniasis, with possible use against other pathogens. The drug’s development is a clear success story of a partnership between WHO, a private company and strongly motivated clinical researchers in endemic countries that proved that drug development for neglected diseases by PPPs is a viable model (figure 1).87–89 However, to date, access to miltefosine is limited, even in a context where preferential pricing should apply, and the manufacturer still has a de facto monopoly of a drug as the only quality-assured source. Based on miltefosine’s development history, we present policy recommendations for the wider drug development context and eventually narrow the train of our focus on practical suggestions to improve access to miltefosine for leishmaniasis. 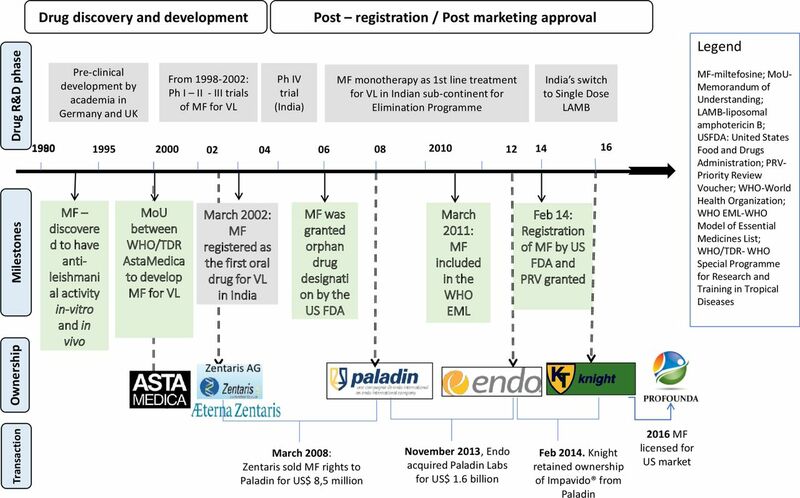 One of the main lessons learnt is that miltefosine’s availability has been affected by the multiple changes in the ownership rights (as shown in figure 1) which resulted in changing distribution or marketing licenses for different subsidiaries over time.90–92 The agreement between WHO/TDR and the initial company—drafted to ensure continuous supply at an affordable price for public health use— could not be enforced with the company’s later successors. The case for needing a stronger agreement to ensure access in the postapproval phase is compelling, especially with the expansion of the PPP model for drug development, through organisations like the Drugs for Neglected Diseases initiative, Medicine for Malaria Venture and other entities. Product development partnerships should set goals beyond mere registration of an NTD drug in endemic countries.93 94 Pharmaceutical or biotech companies targeting neglected diseases seem to operate a niche business model,45 seeking profits from both public and private markets in tiered pricing mechanisms. Tiered or differential pricing structure has been argued as a rational way of funding drug or vaccine availability in endemic resource-poor countries if effective access is indeed provided.95 However, sustained access under preferential pricing may not spontaneously yield robust market mechanisms for demand. Underlying PPP agreements must, therefore, include detailed and transparent provisions for sustained access, including pricing structures and frameworks for monitoring and enforcement.93 96 The absence of these structures and frameworks was a critical factor in the miltefosine journey. Furthermore, deployment strategies for new NTD drugs should also include long-term pharmacovigilance and feasibility studies for various contexts. Another lesson is that some current incentive mechanisms meant to enhance R&D for NTDs seem to defeat their purpose. In 2014, the US FDA approved miltefosine registration for leishmaniasis, and Knight Therapeutics—which had acquired the rights to the drug the same year—was granted a reward: the tropical disease priority review voucher (PRV).97 98 PRV is enacted since 2007 to facilitate the development of drugs for NTDs. If a sponsor achieves approval for a new chemical entity that constitutes a significant improvement for one of the listed tropical diseases, the sponsor receives a PRV which can be used for priority review of any subsequent new drug or biologic under development.99 100 The voucher is transferable, and its value has been estimated to be up to US$350 million101. Several areas need to be addressed to overcome key access barriers to miltefosine (see table 3). Reducing access barriers to a life-saving drug needs a strong and sustained political commitment from the public sector, governments and global actors alike, supported by coherent policies. International coordinated procurement by multilateral organisations or advance market commitments should be sought to ensure miltefosine’s availability in the short term. In this regard, ensuring sufficient buffer or rotating stock at the regional level seems reasonable, if all stakeholders can reach a consensus. More transparent manufacturing timelines could help to avoid shortages, along with the better consolidation of forecast and orders. In the longer run, miltefosine registration in endemic countries needs to be reviewed and pursued. The inaccessibility of miltefosine should not be taken for granted, thus advocacy must continue. The current monopolistic situation must be challenged, hence encouraging new potential producers to enter the market would be beneficial. Harmonised actions to protect access to an essential public health tool, such as miltefosine, must be provided by the global public policy. The miltefosine story demonstrated the complexity of providing access to a promising NTD drug. Regrettably, apart from being a success story in R&D, the miltefosine journey embodies many flaws along the pathway from drug development to end user, and we observed issues of affordability and availability at global and country levels. Anticipated public health impact was hindered, as access barriers at different levels were not overcome. Strategies to expand access to an NTD drug thus must address affordability as a key obstacle, along with supply-side strategies that assure availability. Benefits of publicly funded medical research should be made broadly accessible to patients—neglect and imbalance should not be the end of the story. The authors thank Els Torreele and Piero Olliaro for their critical reading of the manuscript, and Margriet den Boer, Koert Ritmeijer and Jose Postigo for their support. The authors also thank and Sarah Venis, Patricia Kahn, Kristien Cloots, Evelien Paessens; and Barbara Nasto for her expertise and enthusiasm. World Health Organization. Global leishmaniasis update, 2006–2015: a turning point in leishmaniasis surveillance. Wkly Epidemiol Rec 2017;92:557–72. WHO. Leishmaniasis Fact Sheet. 2017 http://www.who.int/mediacentre/factsheets/fs375/en/ (cited 7 Jun 2017).
. Miltefosine, the story of a successful partnership: disease endemic country - TDR - pharmaceutical industry (Zentaris). TDR News 2002;68:5.
. Oral miltefosine may revolutionize treatment of visceral leishmaniasis. TDR News 2002:68:2. Paladin. Application for inclusion of miltefosine on who model list of essential medicines. 2010 http://www.who.int/selection_medicines/committees/expert/18/applications/Miltefosine_application.pdf (cited 13 Dec 2016). WHO. 20th Model List of Essential Medicines: WHO. 2017 http://www.who.int/medicines/publications/essentialmedicines/20th_EML2017_FINAL_amendedAug2017.pdf?ua=1.
. Phase II study of miltefosine 6% solution as topical treatment of skin metastases in breast cancer patients. Anticancer Drugs 2000;11:825–8.
. Overview of the clinical development of miltefosine solution (Miltex) for the treatment of cutaneous breast cancer. Drugs Today 1994;30:59–72.
. Product development pubilc private partnerships for disease of poverty. Are there more efficient alternatives? Are there limitations? IPPPH Meeting, London 15th-16th April. Geneva, Switzerland: Initiative on Public-Private Partnerships for Health, 2004.
. The new landscape of neglected disease drug development: a pharmacetical r&d policy project. 2005. London: London School of Economics and Political Science, Wellcome Trust.
. Miltefosine in the treatment of leishmaniasis: Clinical evidence for informed clinical risk management. Ther Clin Risk Manag 2007;3:733–40. WHO. Control of the leishmaniases: report of a meeting of the WHO Expert Committee on the Control of Leishmaniases, Geneva, 22–26 March 2010. World Health Organ Tech Rep Series No 949. Geneva, Switzerland, 2010:1–186. European Medicine Agency. European medicine agency orphan drug designation for miltefosine. http://www.ema.europa.eu/ema/index.jsp?curl=pages/medicines/human/orphans/2009/11/human_orphan_000280.jsp&murl=menus/medicines/medicines.jsp&mid=WC0b01ac058001d12b (cited 13 Jan 2017). Food and Drugs Administration. Miltefosine orphan drug designation to treat leishmaniasis. 2006 https://www.accessdata.fda.gov/scripts/opdlisting/oopd/detailedIndex.cfm?cfgridkey=229406 (cited 27 Dec 2016).
. Application for inclusion of miltefosine on WHO model list of essential medicines. http://www.who.int/selection_medicines/committees/expert/18/applications/Miltefosine_application.pdf (15 Dec 2016). AdisInsight. Miltefosine. 2016 http://adis.springer.com/drugs/800001883 (cited 1 Apr 2017).
. Comparison of drug approval process in United States & Europe. J Pharm Sci Res 2013;5:131–6. Drugs. Impavido prices, patient assistance programs. https://www.drugs.com/price-guide/impavido (cited 21 Aug 2017). The STAT Team. Drug to combat brain-eating amoeba exists — but how to get it to patients? 2016 https://www.statnews.com/2016/09/16/amoeba-drug-miltefosine/ (cited 26 Apr 2017).
. Knight Therapeutics reacquires leishmaniasis drug Impavido - The Globe and Mail. https://www.theglobeandmail.com/report-on-business/knight-therapeutics-reacquires-leishmaniasis-drug-impavido/article29252299/ (cited 6 Jun 2017). Knight Therapeutic Inc. Knight obtains impavido worldwide rights. http://www.gud-knight.com/en/knight-obtains-impavido-worldwide-rights (cited 10 Jun 2017). National Vector Borne Disease Control Programme - Ministry of Health India. Kala Azar Situation in India. http://nvbdcp.gov.in/ka-cd.html (cited 9 Feb 2018). DNDi. Patient Access to Miltefosine in Developing Countries Not Secure Despite Award of US FDA PRV Sold for USD 125 Million. 2014 http://www.dndi.org/2014/media-centre/press-releases/pr-miltefosine-prv/ (cited 2 Jan 2017).
. A breakthrough in R&D for neglected diseases: New ways to get the drugs we need. PLoS Med 2005;2:0828–32.
. Product development partnerships (PDPs): lessons from PDPs established to develop new health technologies for neglected diseases. London: UK Department of International Development, 2010. https://www.gov.uk/government/publications/product-development-partnerships-pdps-lessons-from-pdps-established-to-develop-new-health-technologies-for-neglected-diseases. Zentaris receives approval to market Impavido in Germany. http://archives.who.int/eml/expcom/expcom14/miltefosine/Attachment1-JuergenEngel_20041207eng.pdf (cited 11 Jan 2017). Evaluategroup. Æterna zentaris receives first regulatory approval for impavido for parasitic skin disease. http://www.evaluategroup.com/Universal/View.aspx?type=Story&id=64808 (cited 11 Jan 2017). Profounda, Inc. launches Impavido (miltefosine), the first and only oral Rx treatment for visceral, mucosal and cutaneous leishmaniasis, in the United States. http://www.prnewswire.com/news-releases/profounda-inc-launches-impavido-miltefosine-the-first-and-only-oral-rx-treatment-for-visceral-mucosal-and-cutaneous-leishmaniasis-in-the-united-states-300238867.html (cited 11 Jan 2017). Drugs for Neglected Diseases Initiative. An innovative approach to r&d for neglected patients: ten years of experience & lessons learned by DNDi, 2014.
. Differential pricing for pharmaceuticals: reconciling access, R&D and patents. Int J Health Care Finance Econ 2003;3:183–205. DNDi. New report reviews the successful development of the antimalarial ASAQ. 2015 https://www.dndi.org/2015/media-centre/news-views-stories/news/asaq-lessons-learned/ (cited 22 Jun 2017). Knight Therapeutics Inc Announces FDA approval for impavido® (miltefosine) for the treatment of visceral, mucosal and cutaneous leishmaniasis - awarded priority review voucher. http://www.gud-knight.com/en/knight-therapeutics-inc-announces-fda-approval-for-impavido-miltefosine-for-the-treatment-of-visceral-mucosal-and-cutaneous-leishmaniasis-awarded-priority-review-voucher (cited 2 Jan 2017). Marketwired. Knight sells priority review voucher to gilead. http://www.marketwired.com/press-release/knight-sells-priority-review-voucher-to-gilead-tsx-gud-1969777.htm (cited 2 Jan 2017). WHO. WHO aims to improve access to antileishmanial medicines in affected countries. 2016 http://www.who.int/neglected_diseases/news/improve_access_to_antileishmanial_medicines/en/ (cited 19 Jun 2017). Contributors TS, JP and MB conceived the paper. TS wrote the first draft. TS, JP, MB approved the final script. Funding This study has received funding from the European Union’s Horizon 2020 research and innovation programme under the Marie Sklodowska-Curie grant agreement No 642609.